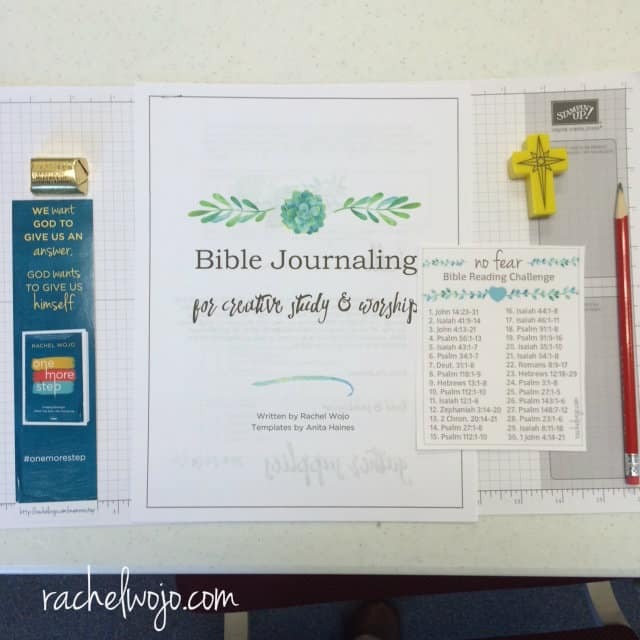 What is Bible journaling all about? Since last May when I began to see Bible art journaling in my Pinterest feed, I became intrigued by the combinations of art and Scripture together. Not because I’m a drawer or painter, but because I was in a dry spell of personal Bible study. I could feel myself being a little weary of traditional study methods, as much as I love any type of studying. I just needed a change. So I began to explore Bible art journaling. Over the past year, it’s been interesting to see my art journey growing and changing, much like the journey of faith. If you spend time working on art, then you learn the methods and start to see progress and transformation. Just like growing your faith- spend time cultivating a relationship with God and what happens? You grow closer to him! Whether handlettering or drawing, Bible journaling has become a precious way for me to spend time with God, reflecting on His Word, praying and worshiping Him! In January of this year, I was able to share what I’ve learned with the folks at my local Lifeway store. On a bitter winter day, we had a packed store of folks interested in learning more about Bible journaling. It was so fun! 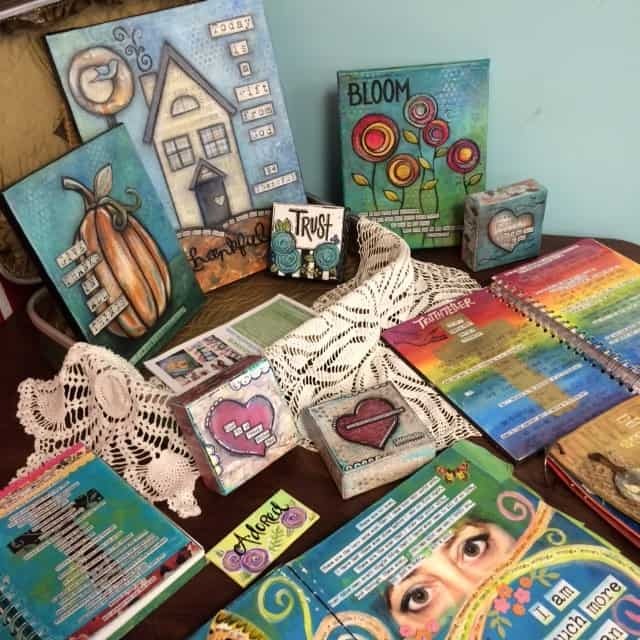 Then, this past Saturday, I taught my first Bible journaling workshop at a local church and again, enjoyed sharing what I’ve learned in the last year. I also invited my friend, Anita, to come along with me. Because she IS an artist and I have so much to learn from her. Her art is absolutely beautiful, as you can see below!! Bible Journaling is simply a form of Bible study. Where you are using a Bible reading plan, choosing a favorite verse, or working through a devotional, pray and ask the Lord to guide your thoughts as you begin to read. I like to recommend reading the passage one time through at a normal pace, then reading a second time at a slower pace. Relfect on the passage and note key words or phrases speaking to my heart. Use a separate piece of paper or practice journal and write the highlighted phrase or verse on it. Express and a thankful heart to God and talk to him about the passage as you begin to craft letters. Sketch your handlettering, doodle art, or drawing on a practice page as an outline. This stage is a rough draft for me. Handlettering reflects your personality and from the time you began to learn to write, your letters have reflected who you are and even how you feel. Your own handwriting is a beautiful place to begin to journal and highlight what you are learning from Scripture. Doodle art is a fun way to express yourself as well. Doodling is creative and there are no right or wrong ways to do it. You simply start to draw and then gradually add more as you freely reflect and think. 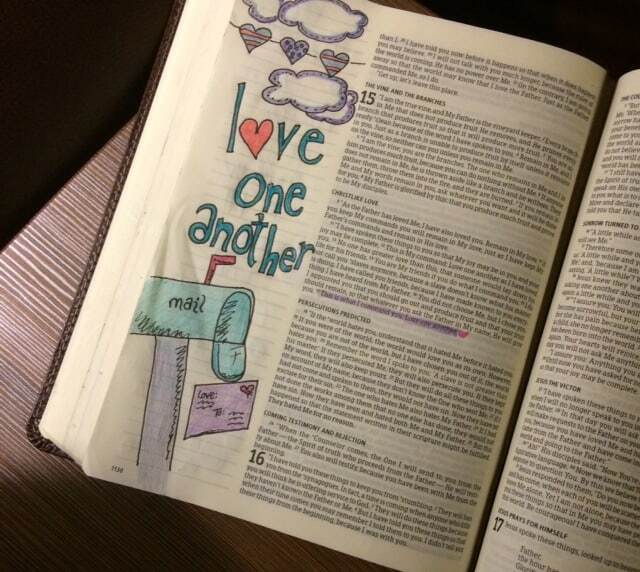 Place your rough draft beside your journaling Bible or blank journal and pencil in the artwork. Once you are content with your final sketch, it’s time to ink it in. Using black ink or colored pens, outline your lettering. Finish all ink, then color in the basic design. Choose accent colors and shade or accent as desired. Thank the Lord for the time to focus and meditate on his word. Lift up the work as a love offering and worship to him. If you’d like to learn more about Bible journaling, I have a wonderful free download for you today! I’m offering the Bible Journaling Workbook for creative study and worship that I used on Saturday to teach the Bible Journaling workshop. My friend, Anita, designed the templates we used in the workbook and below is an example of her beautiful Bible art journaling. You’ll find a copy of this design as a blank template within the workbook and slide it right under your journaling page to copy over it. 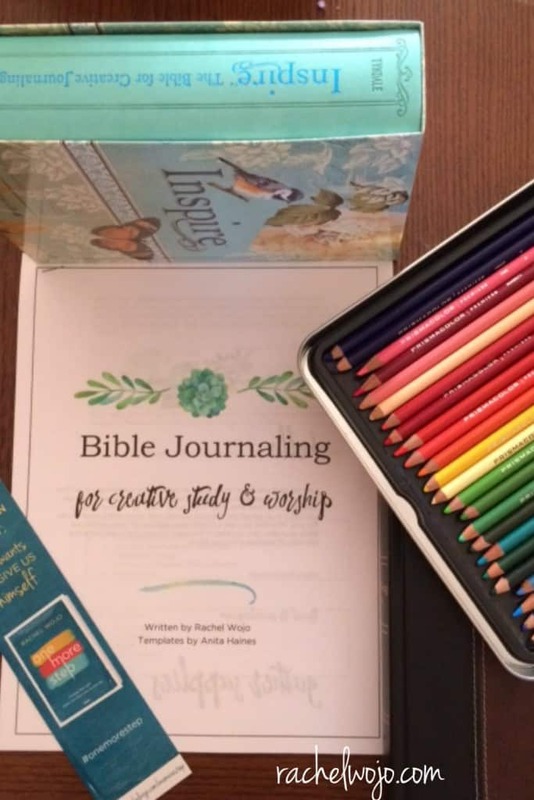 I hope you are encouraged to give Bible journaling a try and enjoy the beginner workbook to the fullest! 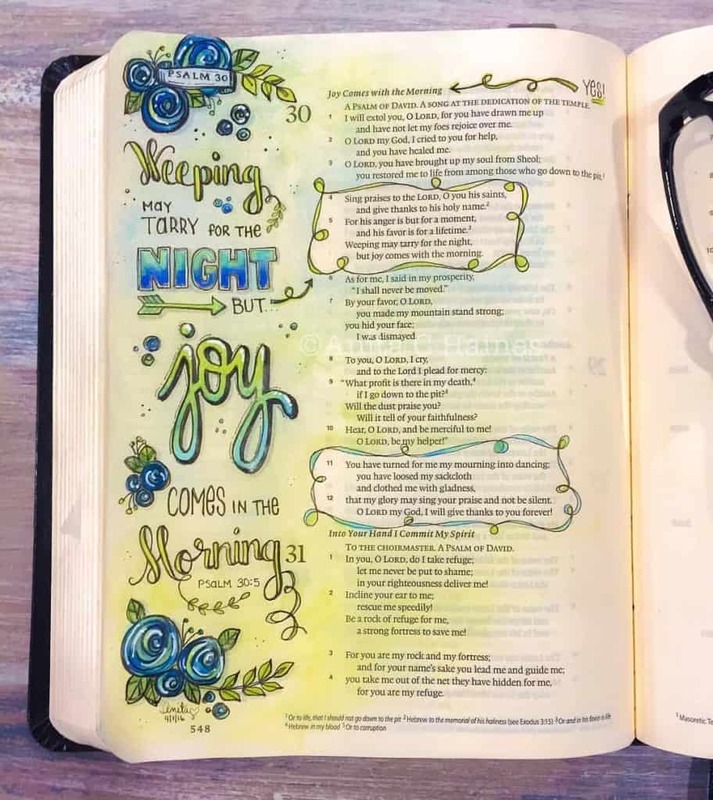 Be sure to visit my friend, Anita’s, beautiful blog for more inspiring art and check out the resources below for more on Bible journaling! 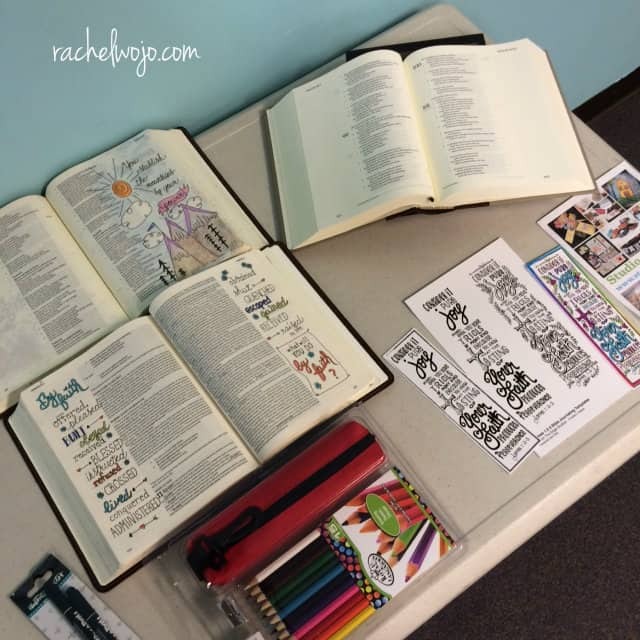 For Bible journaling speaking/workshop requests, please email rachel@rachelwojo.com. So sad!! When I clicked the link for the free workbook, my antivirus software wouldn’t let me open it. It said there were THREE infections blocked! It is a pdf. Not infected at all; I crafted the file myself. Please email me at rachel@rachelwojo.com if you still can’t get it and I will reply to your email with the file. The templates are beautiful!! What a lovely resource!! I received a similar notice that it couldn’t open the pdf for the workbook. It opened perfectly for me and I LOVE it! Thanks so much for the ideas on lettering and the Additional Elements! I must admit I haven’t started because I’ve been a little intimidated, but from what you have shown, I now feel the confidence to do it and I cannot wait. I’m going to get a separate book for my journaling. You have truly inspired me. Thank you for loving our Lord so much and being obedient to Him, by sharing your talents and ideas with us. God is so good, and worthy to be praised! It opened for me; it actually gave me options of where to open and I use iBooks to open. Thank you so much for having so many free gifts for all of us readers. God is using you in many ways. I look forward to your posts. I don’t have any experience with your question; the Inspire Bible I have is the softer cover and works well. I have a feeling the hardbound may be the one that won’t flatten well. Not absolutely sure thought. Enjoy!! You are so welcome! Oh my goodness. I love the Free 15 page pdf…your simplicity of style is refreshing. I do enjoy it. Thanks so much! Thank you so much — it’s perfect timing — my journaling Bible arrived in the mail this afternoon and I was getting nervous about ‘wrecking’ it with my amateur doodling — your workbook is so beautiful and inspiring. I think I can do this!! I RAN to my Inspire Bible hoping that that verse was not already one of the premade line art drawings already in my bible. Happy dance!!! It’s not! I can’t wait to use the tools you’ve so graciously GIVEN to recreate this verse and others! Because I’m a southern baptist baby, I can fall into the “checklist” mentality. Those simple words encouraged me to just start where I am and simply ask God to guide our quiet time (and in fun and creative ways might I add! ).